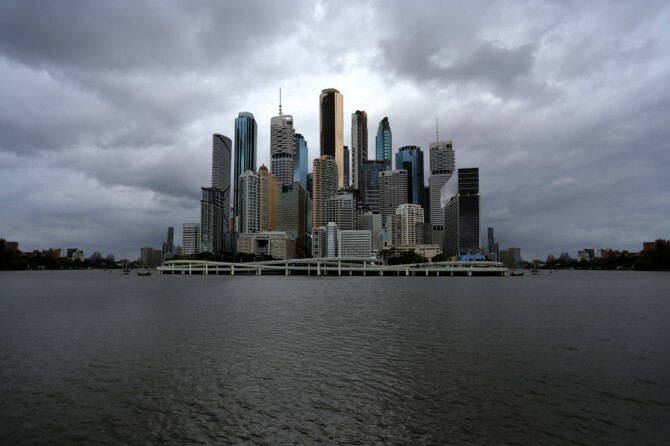 Displaying his new work earlier this year at the Auckland Festival of Photography as the Sacred Hill Annual Commission exhibition, photographer PJ Paterson will be taking this series of work to China to be displayed at the Pingyao International Photo Festival in September. This is the first time an artist has been able to participate in a dual-presentation of an Annual Commission developed work. An example of imagery from this series is illustrated above. D-Photo's Adrian Hatwell recently had the chance to talk to Paterson about his circuitous road to discovering photography, exhibiting work, and being acknowledged as a rising star of contemporary art. There is always something slightly impossible about the imagery of PJ Paterson, but it’s cleverly tucked away on the stage of the conceivably feasible. 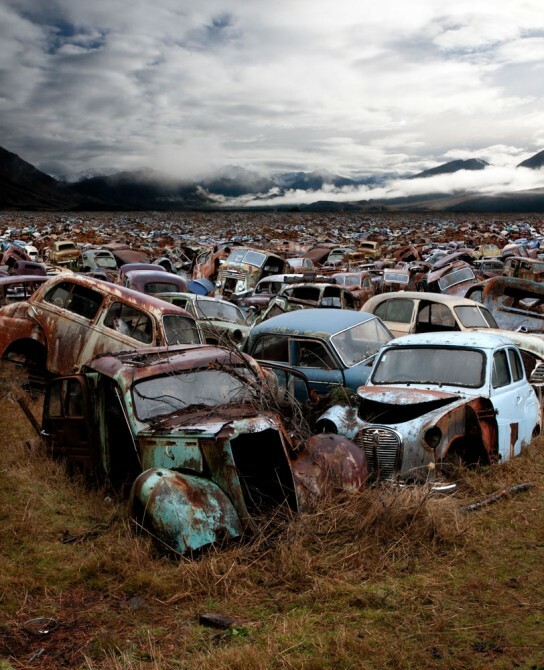 An ocean of twisted, rusting auto wrecks sprawled before a brooding mountainscape. A brutalist apartment complex that looms several magnitudes larger than common sense suggests likely. Rows of ticky-tacky suburban houses repeating on a scale that only exists in ambitious municipal nightmares. Eschewing photography’s common claim to objectivity, Paterson constructs his fantastic landscapes to reflect not what he’s seen, but how he felt while seeing it. Using Photoshop to cut out and assemble elements into a single scene, or digitally exaggerate the properties of an image’s subject, Paterson creates what he calls digital collages. The result is a meticulously arranged photo that strikes the viewer at first glance as a real, albeit impressively strange, location. The illusion is not built to last, and it quickly becomes obvious that the artist has expertly tinkered to enhance the foreboding feeling of the work. It’s a lie, but an open one, and in service of its own unconventional truth. Paterson’s own beginning as an artist is equally unconventional. Originally an electrician with no formal art training, he became a self-taught painter and later photographer, made his way through the ‘back door’ of the gallery world, and has this year been selected as the Auckland Festival of Photography’s Annual Commission recipient. Paterson says that getting the award was very special for him, as it came completely out of the blue, and was not something he applied for. Paterson has not walked a straight path in getting to this point in his career, but he easily locates the event that started the electrician with no art experience on a course to be celebrated as one of Auckland’s most promising photographers. While in his mid 20s, Paterson’s then wife decided to open an art gallery. He would make his sparky rounds by day, then work into the night to help out at Auckland’s Sanderson Contemporary Art Gallery, which became an important exhibition space for emerging local artists. Over the years the gallery grew and took on additional staff, Paterson moved into a managing role, and his constant exposure to new artists ignited a curiosity within him. “All the time I would see stuff come through, all kinds of art, and I’d think: I like it, but what if it was like this, or like that?” he recalls. Working at the gallery may have kick-started Paterson’s creative brain, but it wasn’t until going through some major personal upheavals that he found the motivation to act on those impulses. Paterson and his gallery-owner wife separated and, feeling burned out, he decided to take a year off and “not do anything”. It might not sound like the most constructive of plans, but the decision would end up being instrumental in his artistic transformation. For his first project, Paterson’s eye had been caught by a collection of wrecked old steam train carriages at the bottom of the Auckland suburb of Parnell, which he often walked past on his old day job. Captivated by the scene’s unsightly yet somehow alluring decay, he snapped photos of the wreckage and took them home to paint up in what he describes as a pop-art style. Abuzz with creation, the fledgling artist wanted to see if his works appealed to anyone else, and knew just the experts to go to, his old colleagues at Sanderson. Paterson was quick to claim credit for the work once it was clear he was on to a good thing, but he soon began to feel as though the images he wanted to make might not be best served by the medium he was working in. During his time at the gallery he had the opportunity to talk with many of the exhibiting artists, and Paterson recalled multi-disciplinary artist Young Sun Han once telling him how he “mistrusted” painters, because of the idea it was something anyone can do. This realization came to fruition on a trip to Portugal around five years ago. Paterson was travelling the southern European nation, and had with him a series of photographs he intended to paint up. But with no access to a studio, he started to play around with the images in Photoshop on his laptop, and came to realize that he could achieve his aims more effectively through post-production techniques than painting. From this epiphany came the first instances of Paterson’s immediately recognizable digital collage style, a reimagining of the isolated Smash Palace wrecking yard in Horopito, in which the discarded husks of abandoned cars retreat endlessly into the horizon. This would be the first in an ongoing meditation by the artist on the physical and psychological artefacts of post-industrial society. The artist’s bold style has led many viewers to read a straightforward over-consumption or environmental message into the works, but Paterson sees his vision as a more conflicted reflection on his own faults. He is also not out to explicitly condemn society’s excess, though there are certainly elements of that, but Paterson appreciates the strange beauty that can come from failings or unintended consequences on such a monumental scale. This was particularly evident on his recent trip to China to create new works as part of the Annual Commission appointment. It’s a fascination that carries through strongly in Paterson’s beguiling digital collages, though he fully appreciates that it is not to everyone’s taste — and can be particularly vexing to other photographers who view in-camera technique as sacrosanct, and regard digital manipulation with borderline disdain. But Paterson takes criticism in his stride, confident in his mission as an artist to convey his feelings, inspired by his experience of the landscape, through any method necessary.